Sri Lanka’s most awarded hotel Heritance Kandalama, emerged Champions at the Bocuse D’Or Culinary Competition, competing against both international and domestic star-class city and resort hotels recently. Chef W.M Augustus Lowe, Chef De Cuisine at Heritance Kandalama with twenty two years of experience in the culinary field and his apprentice, B.A.L.H Thisera, Commis III with 3 years of experience in the field were the winning duo who bought glory to Heritance Kandalama. The team together created the award winning menu: Gremolata rubbed spring lamb rack, mushroom apple duxelle in, prosciutto wrapped braised lamb rump; grilled pepper millefuille . glazed petite vegetables in a daikon boat , curried sweet potato mousse accompanied with three sauces and a warm punch of brilliant breakfast tea infused with roma tomato water. 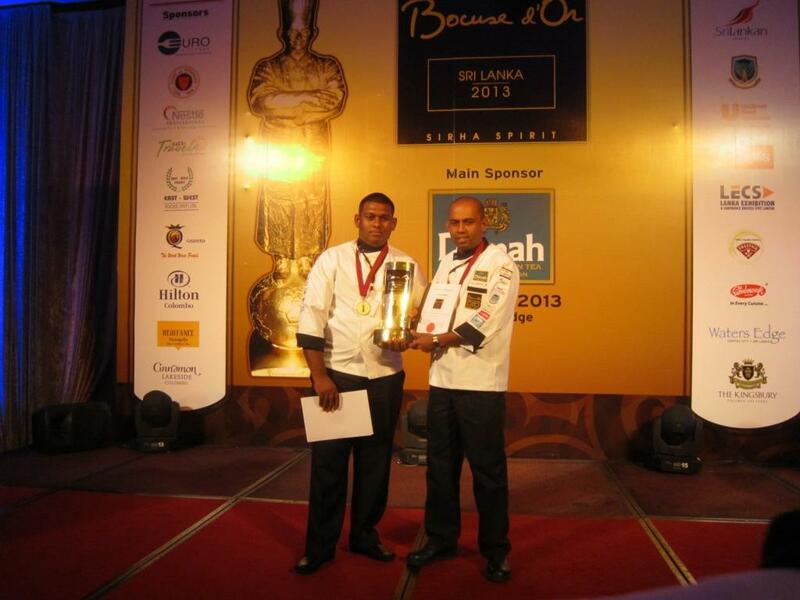 The champion team from Heritance Kandalama will now represent Sri Lanka at the Asian Region Bocuse D’Or Culinary Champion which is scheduled to take place in Shanghai in 2014. The winners of the regional event will then participate in the World Bocuse D’Or competition in Lyon, France in 2015. Chef Paul Bocuse , considered as the God father of the culinary world, is the founder of the Bocuse D’Or , a world chef championship recognized by Chefs globally. Renowned as one of the most prestigious competitions in the world, Bocuse D’Or judges the skills of chefs evaluated over a period of two days; where only the best chefs with the most innovative dishes emerge winners. “Our Chefs have been recognized at international events such as the Culinary Olympics and the Culinary World Cup. Winning this competition is yet again a stepping stone on to a world platform where our chefs have the opportunity to demonstrate their skills and be awarded for their talents. Our constant determination to be the best has bought us thus far. Being firm believers of sustainability we take measures to ensure that our future generation is provided with the knowledge required to take on the baton when required. Winning accolades such as this, year after year reaffirms our stance as the most awarded culinary brigade in Sri Lanka”, said Mr. Gemunu Goonewardene, Vice President, Food and Beverages, Aitken Spence Hotels. Heritance Kandalama has been a trend setter in various aspects of hotel operations and has received many accolades for its cuisine, both in Sri Lankan and internationally. “Aitken Spence Hotels over the years has been recognized for its exquisite food and culinary art which has placed us amongst the best in the region. Prestigious accolades such as this serve as motivation to the team to further excel in these competitive times. The relentless efforts put forth by our team have been recognised both locally and internationally and we are proud to note that our greatest asset is our dedicated and passionate team.” said Mr. Malin Hapugoda, Managing Director, Aitken Spence Hotels. 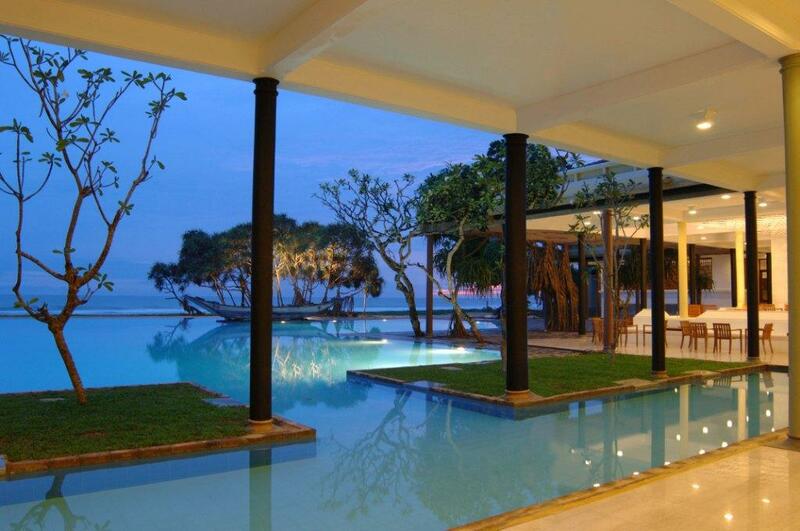 Aitken Spence Hotels is the largest resort operator in Sri Lanka and the largest international hotel operator in the Maldives with a portfolio of hotels in multiple locations in India and Oman. Its range of international award-wining properties, management & culinary expertise and environmental commitment has set industry benchmarks both domestically and internationally. Aitken Spence recently entered into a public-private partnership with the Fiji Ports Corporation to oversee the repair and operation of Suva and Lautoka ports, the largest in Fiji; marking the first- ever public-private partnership by a Sri Lankan company recorded to-date. 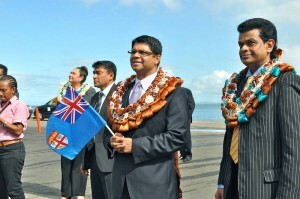 Fiji media reported that the partnership is worth an estimated US$10.5 million. Aitken Spence PLC will own 51 per cent of the stake in Fiji Ports Terminal Ltd, the joint venture company, taking control of the business in two ports for a period of 15 years. The Prime Minister and Minister for Finance of Fiji, Commodore Josaia Voreqe Bainimarama, in his speech at the occasion said, “When we invited expressions of interest in a Public Private Partnership to invest in and manage Ports Terminal Limited in December, Aitken Spence came to us with a comprehensive blueprint to boost the efficiency and productivity of our port movements. We share the same vision to make these container terminals world class, to radically overturn the inefficiencies of the past and apply best practice to eventually establish them as the leading ports and maritime logistic centres in the Pacific”. “Aitken Spence has a reputation for certain things my Government values most – innovation, imagination, thinking outside the box. We see it as the ideal partner to improve the overall performance of our two main ports and look forward to implementing our joint vision to transform the operations in Suva and Lautoka,” he further added. The Fiji Sun quoted Aitken Spence Maritime Chairman Dr. Parakrama Dissanayake speaking to reporters at the official ceremony as saying, “I’m confident the public-private partnership will result in the establishment of Fiji as the gateway to the South Pacific. We will bring in the global best practices in human resources and the processes in the system and also in the sphere of having the right machinery to having the right level of productivity”. Fiji Times had earlier reported that the poor management and lack of performance at the Suva and Lautoka ports are the main reasons behind the government’s decision to hand over the management of the ports to Aitken Spence. Diversified bluechip Aitken Spence PLC reported a pre-tax profit of Rs 937 mn for the first quarter, a growth of 2.1 per cent, over the previous year, while the Group’s profit attributable to shareholders of the parent grew by 4.1 per cent to Rs. 667 mn. The Company’s financial results for the three months ended 30th June 2013 released to the Colombo Stock Exchange on Wednesday, reported that the revenue for the first quarter declined by 11.3 per cent to Rs. 7.64 bn, while earnings per share for the quarter stood at Rs. 1.64, an increase of 4.1 per cent over the corresponding period in the previous year. The Tourism sector, which includes hotels in Sri Lanka, the Maldives, India and Oman as well as the leading destination management company in Sri Lanka reported healthy returns. Cargo Logistics and the Strategic Investments sectors reported a decline whilst the Services sector showed steady growth. Aitken Spence is among Sri Lanka’s leading and most respected corporate entities with operations in South Asia, the Middle East, Africa and the South Pacific. In Sri Lanka, it is an industry leader in hotels, travel, maritime services, logistics, power generation and printing, with a significant presence in plantations, financial services, insurance, information technology and apparel. J M S Brito, Deputy Chairman and Managing Director of Aitken Spence PLC said, “We are pleased to report overall modest growth in profits for the quarter despite a challenging environments in several of our key sectors. A strong performance from our geographically diversified tourism sector contributed strongly to the Group’s performance”. During the quarter, Aitken Spence PLC launched Empowering Sri Lanka First, an English and IT teaching programme for children from its neighbouring communities as its flagship corporate community engagement initiative. The leading diversified conglomerate commenced the pilot phase of the English programme benefiting 180 students in Dambulla, Ahungalla and Mawaramandiya in May. The eight-year old students follow a globally recognised British Council syllabus combined with accompanying teaching material delivered by local teachers who have completed British Council conducted teacher training. Sri Lanka’s premier beach resort Heritance Ahungalla, emerged as the Most Outstanding Culinary Team in Sri Lanka after competing against both international and domestic star-class city and resort hotels at the 15th Culinary Art Competition held from the 2nd to the 5th of August. Heritance Hotels dominated the competition with Heritance Kandalama being adjudged the first runner up in the overall competition. Organized by the Chefs Guild of Sri Lanka, the culinary competition is part of the industry’s largest food and trade exhibition. 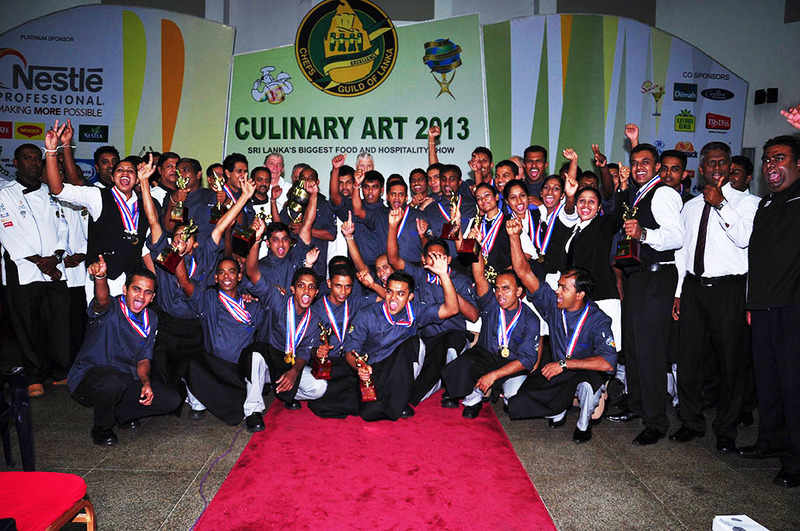 Maintaining its reputation for offering the best cuisine in the country, Aitken Spence Hotels won an unprecedented 150 medals including the prestigious award for the Most Outstanding Culinary Team in Sri Lanka. There were 25 categories for the medals and the Aitken Spence medal tally displayed the sheer dominance the resort chain’s chefs had over its competitors in the field. World acclaimed Chef Dimuthu Kumarasinghe – Group Skills Development Chef, Aitken Spence Hotels and Heritance Hotels who led the team along with Chef Lalith Gunesekera – Consultant Chef, Aitken Spence Hotel Managements and Chef Kasun Premachandra, Executive Chef, Heritance Ahungalla whose continuous training and motivation guided the participants, were jubilant along with the teams from Aitken Spence Hotels who collectively won 16 special awards out of a total of 29 special awards. The special awards included the following: Most Outstanding Chef – Chef Y.K.P De Silva, Heritance Ahungalla, Most Outstanding Pastry Chef – Chef W.M.J.A Bandara, Heritance Ahungalla, Most Outstanding Apprentice – Chef L.H.S.N.R De Silva, Heritance Ahungalla, Best Bartender Mixologist – H.D.S.N Jayasekera , Heritance Ahungalla, Best Beer Cocktail –H.D.S.N Jayasekera, Heritance Ahungalla, Nescafe Creative Coffee- S.P.S Fernando, Heritance Ahungalla, , Best Sunquick Mocktail- H.D.S.N Jayasekera, Heritance Ahungalla, Best Wedding Cake Structure – Chef S G Wijesundera – Heritance Ahungalla, Most Outstanding Apprentice Hot Cooking Live – Chef L.H.S.N.R De Silva, Heritance Ahungalla, Best Plated Appetizer – Chef T.M.P Peiris , Heritance Ahungalla, Best Sri Lankan Meal – Chef Krishna Kumar and Chef C J Kumarasinghe, Heritance Kandalama, Best Arrack Cocktail – N.H Jayasinghe, Hilltop Hotel, Best Regional Hotel- Heritance Ahungalla, Most Outstanding Hotel- Heritance Ahungalla, Most Outstanding Culinary Team 1st Runner – Heritance Kandalama and the prestigious Most Outstanding Culinary Team – Heritance Ahungalla. “I am tremendously proud of the achievements of our team, walking away with 150 medals from a competition such as this is a tremendous achievement. We constantly strive to be the best and are firm believers of ensuring that our future generation is provided with the knowledge required to take on the baton when required. Winning accolades such as this, year after year reaffirms our stance on the sustainable development of our future generations”, said Mr. Gemunu Goonewardene, Vice President, Food and Beverage, Aitken Spence Hotels. Chefs Guild of Sri Lanka from their modest beginnings in 1988 has emerged as the premier professional body of culinary professionals in the hospitality trade. A platform for recognizing true culinary talents, the competition symbolizes the pinnacle of excellence as hundreds of practitioners in the food & beverage industry in the country gathers to prove their mettle. “Aitken Spence Hotels cater to a diverse market segment and are famed for its exquisite food and culinary art. Over a period of time the reputation gained in this specialisation has helped to position the chain of hotels as among the best in the region. We recognize that our greatest asset is our staff at all levels who are loyal, dedicated and committed and work together as one team assisting and encouraging each other to be the best.” said Mr. Malin Hapugoda, Managing Director, Aitken Spence Hotels.